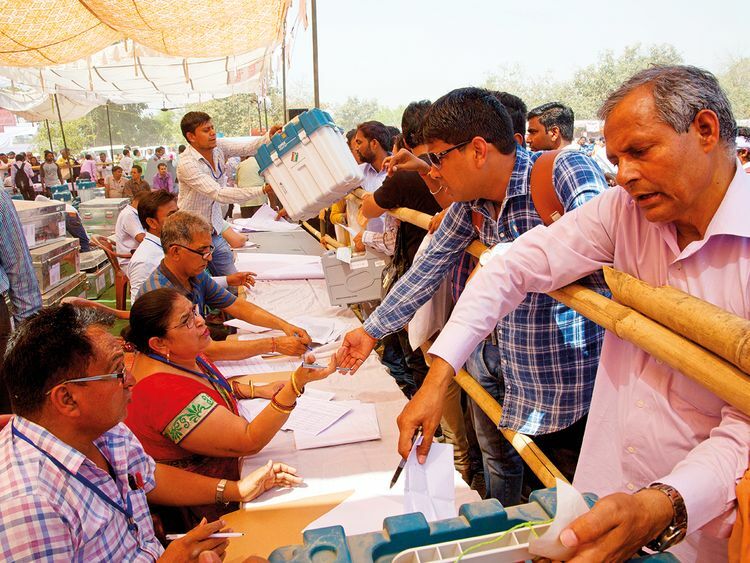 India’s general elections with over 900 million eligible voters represents almost 10 per cent of the world’s population, making this the largest ever democratic elections in the world. Out of this 84 million are first-time voters, young voters who just crossed the minimum voting age of 18. General elections in India choose members of parliament – to both the lower house (Lok Sabha) and, indirectly, the upper house (Rajya Sabha). Lok Sabha members are directly elected by the citizens of India. Rajya Sabha members are elected by the method of indirect election. The representatives of each State and two Union territories are elected by the elected members of the Legislative Assembly of that State and by the members of the Electoral College for that Union Territory. 12 members are nominated by the President as well. Who is in power now? Narendra Modi is the current Prime Minister of India, then leader of the Bharatiya Janata Party which came into power in 2014 in a landslide victory. #CongressManifesto2019: What’s in it for India? How can a party win to create the national government? Lok Sabha majority is what every major party looks to in order to retain leadership or oust the ruling party. The Lok Sabha has 543 elected members from all Indian states, with two reserved spots in case the President nominates representatives from the Anglo-Indian minority community in India. Any party or party alliance must have a majority of 272 seats to be able to form a government. In 2014, Modi’s BJP won 282 seats with a clear majority, while opposition party Indian National Congress won just 44 seats. It was the first time a single party achieved this majority since 1984. What are the major parties focusing on? The two key opposing forces are BJP and the Congress – both have released their election manifesto with plans and promises in case they come into power after the elections. For BJP, a focus has always been Hindutva or protecting/promoting the Hindu ideology, fueling divisions between the Hindu majority in the country and the 200-million strong Muslim diaspora – this hasn’t endeared the party or Modi to many. Modi in 2014 had promised jobs for the very high and still increasing employable young population but India's unemployment rate reportedly rose to a 45-year high during 2017-2018. Modi’s controversial demonetisation move – aimed at combatting black money dealings and hoardings by cancelling big denomination notes of 500 and 1,000 – also turned out to be a black mark on his record. The Reserve Bank of India reported that 99.3 per cent worth of cancelled denomination notes had been accounted for. In pros, according to a CEO and readers’ survey by the Economic Times, the government’s infrastructure push and its efforts to strengthen Brand India are seen as its biggest achievements. Modi made more than 41 trips to over 56 countries – meeting world leaders and business leaders – which could be seen as a propagation of an India that is less protectionist, wants more FDI therefore encouraging trade and manufacturing based out of India. Modi’s rival Rahul Gandhi of the Congress Party, in their manifesto, is focusing on jobs – the area Modi failed on and the country suffers the most at this point. The party released a 55-page document titled “We Will Deliver” focused on addressing the issues of joblessness, farm distress, safety of women and boosting the rural economy. The polls started on April 11 and will end on May 19 – a staggered seven-stage polling system. Votes are scheduled to be counted on May 23, with the results expected to be announced on the same day.